Like other national labs, Lawrence Berkeley National Laboratory exists to tackle the biggest, hardest scientific challenges; however, Lawrence Berkeley is different in that they are the only national lab that is wholly managed by the University of California and is 100% dedicated to open research. The lab represents a $1 billion per year federal investment that benefits the entire University of California system with more than 4000 California scientists use these facilities each year, including researchers from every UC campus. 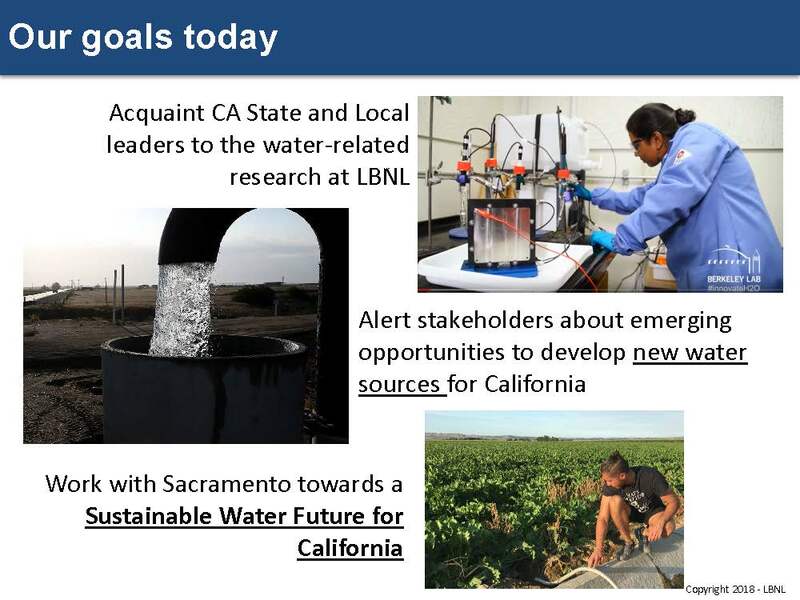 At a forum at the UC Center in Sacramento earlier this year, researchers from the Lawrence Berkeley National Laboratories discussed their research on groundwater recharge, brackish desalination, and seawater desalination. Dr. Peter Fiske is the Director of Water Energy Resilience Research Institute at the laboratory, which brings together researchers from multiple disciplines to tackle the biggest challenges in water. 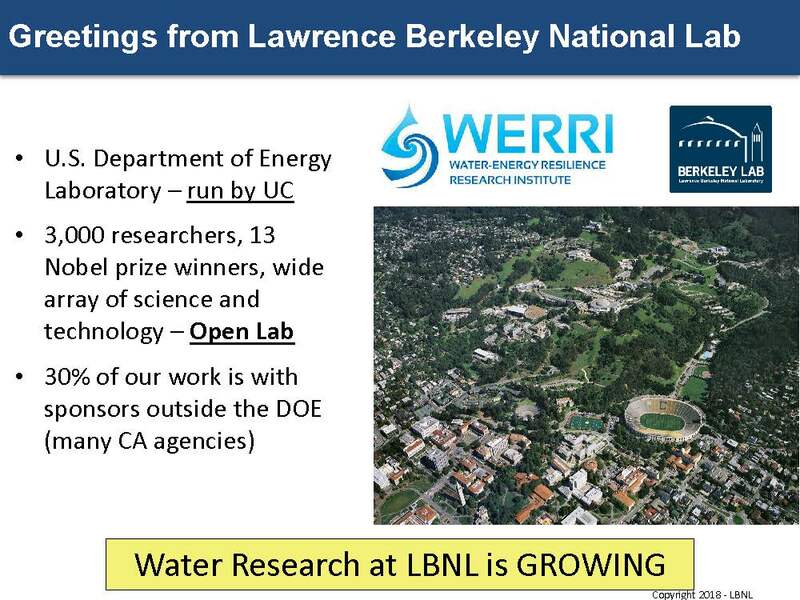 He began by noting that the Lawrence Berkeley National Laboratory possess some of the premier research capabilities for tackling challenging problems, such as water. About 30% of research is conducted in collaboration with other sponsors besides the Department of Energy, some of those being California agencies. Dr. Fiske explained that the Department of Energy focuses on water because water is intimately related with the production of energy, from the use of water for oil and gas production to the use of water for refining fossil fuels. 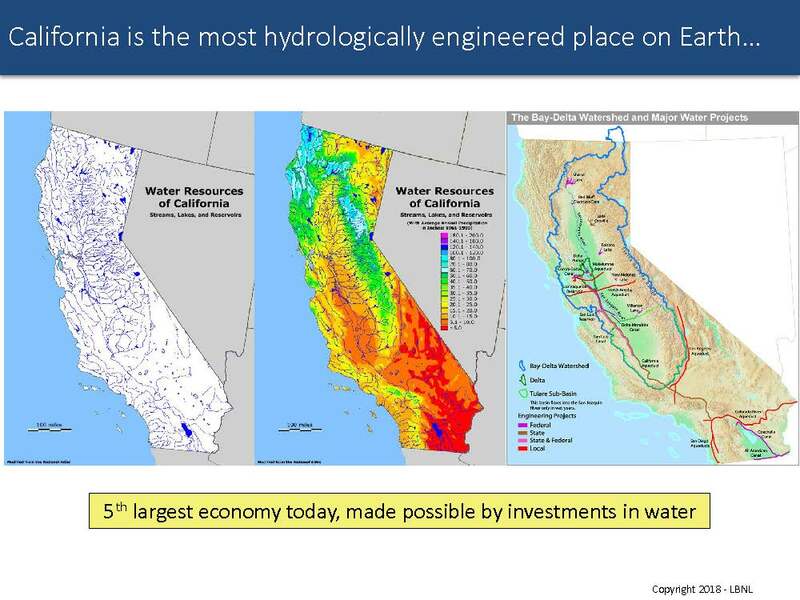 In California, water is used directly to generate power with hydropower, as well as the power plants that need water to use water in the cooling process to regulate their temperatures. 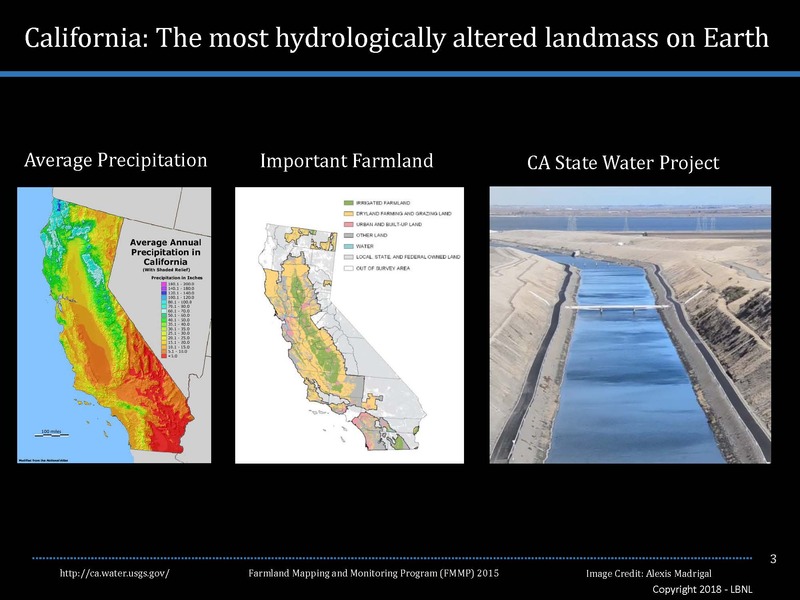 California has long recognized that water and energy are a coupled problem, and Dr. Fiske noted that the recent drought provided an interesting opportunity to realize just how inextricably linked water and energy were. During the drought, the citizens of California responded admirably to the call for water conservation, achieving about 25% reduction in water use. 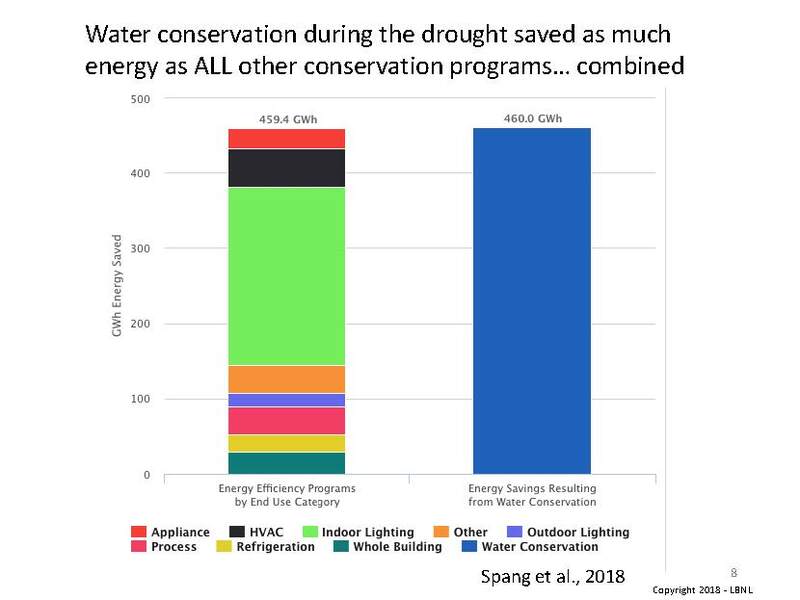 A team of researchers at UC Davis looked at the amount of money being spent through a wide variety of different energy conservation programs, covering all aspects from building energy conservation to clean vehicle conservation. 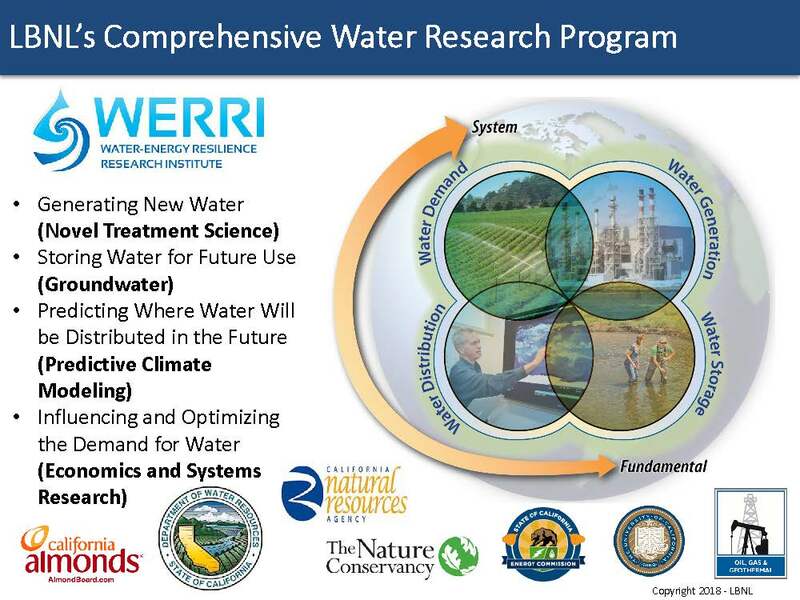 A comprehensive R&D group has been organized at Lawrence Berkeley National Laboratory called the Water Energy Resilience Research Institute (or WERRI), which is organized around four basic themes: Generating new water sources such as improving water treatment technologies to make it more energy and carbon efficient, and developing water treatment processes to treat water that cannot be economically treated presently; Storing water for future use, with groundwater being the principal area of storage for California; Predicative climate modeling to determine where the distribution of water in the future as well as the where the risks will be; and how to influence and optimize the demand for water systems and how to create programs that align the energy and water efficiency with the needs of citizens. Dr. Peter Nico, Program Domain Lead for Resilient Energy, Water, and Infrastructure, first discussed how to save water for a sunny day through water storage and groundwater banking. Dr. Chinmayee Subban next discussed how emerging low-cost high efficiency desalination technologies can take groundwater that presently is not usable and clean it to the point where it could be used for agriculture. Dr. Dan Miller then wrapped it up with a discussion on the emerging trends in ocean desalination. 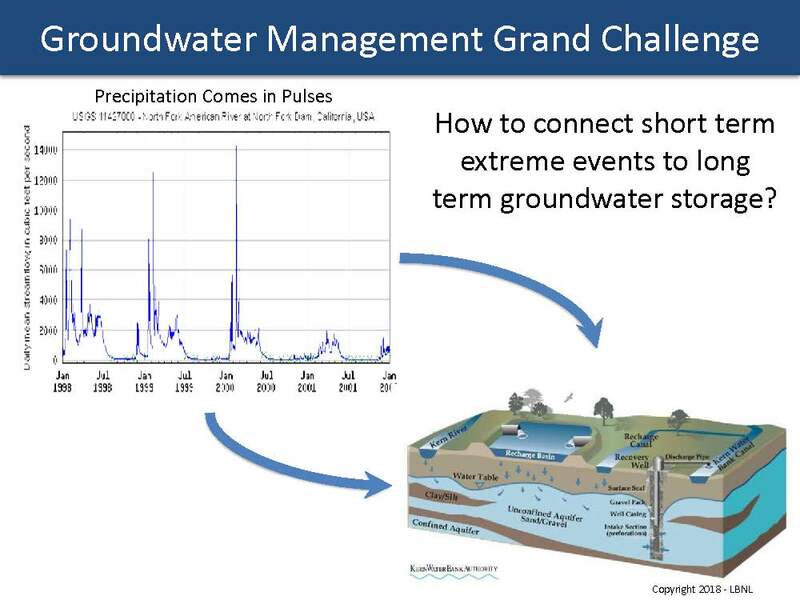 Dr. Peter Nico leads the Resilient Energy-Water Infrastructure Program, and his presentation focused on groundwater management and using groundwater storage to smooth out the swings between drought and flood. 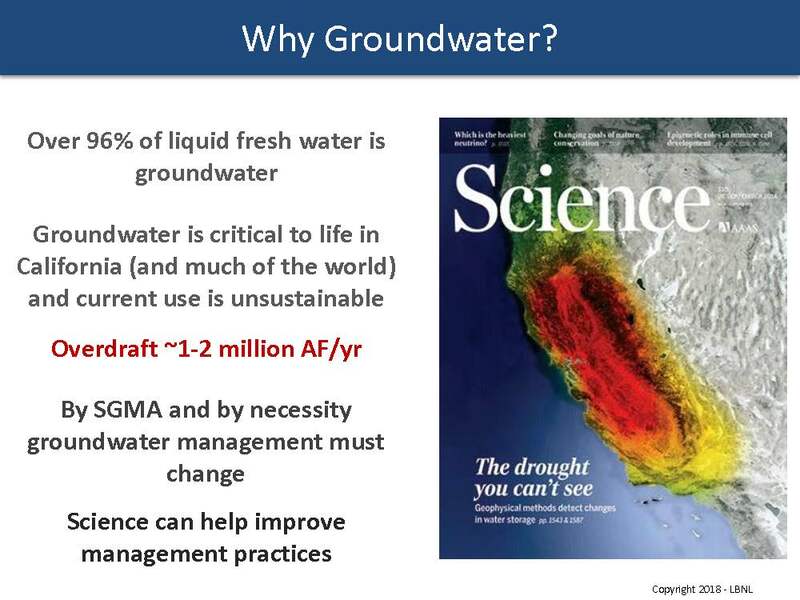 In 2014, California passed the Sustainable Groundwater Management Act, which means that groundwater management needs to change. 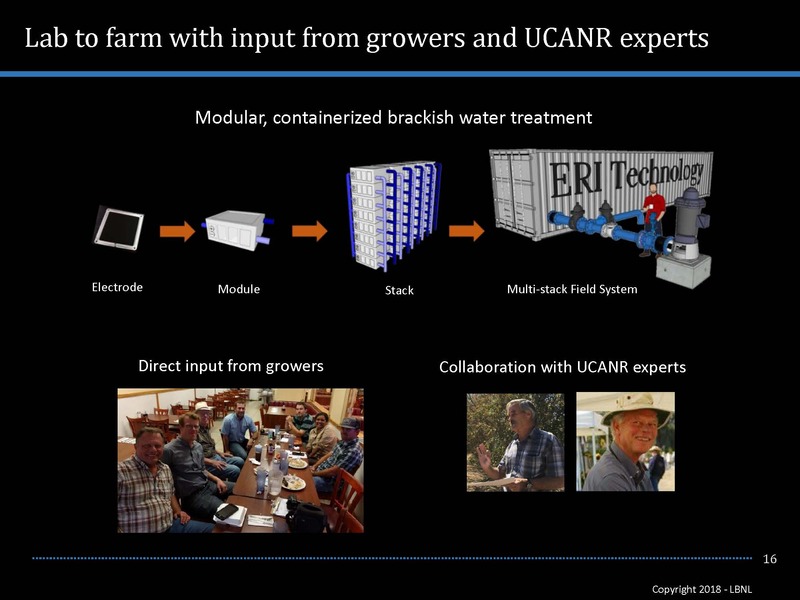 Dr. Nico said that science can help improve management strategies, so he will discuss some of the science solutions that researchers at the laboratory have been working on to help with groundwater issues. 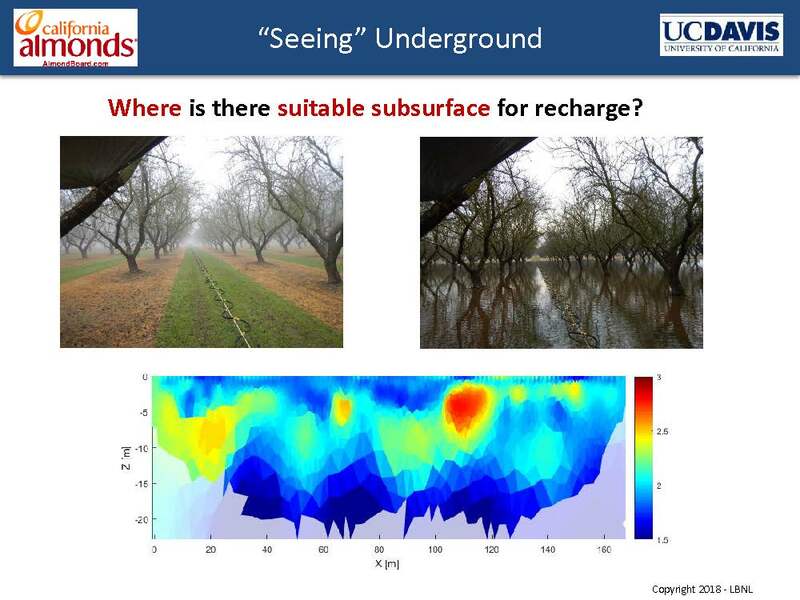 One of the tools that researchers at the Lawrence Berkeley National Laboratory have been working on is using agricultural land to infiltrate water; however, one of the challenges is determining where there is suitable subsurface for infiltrating water, as not all land is suitable for infiltrating water into the aquifers. Researchers have been repurposing technologies to help see the underlying geology to assess the suitable lands for recharge. One example of a project they are working on is spreading out water on an almond orchard in the winter. The picture on the right hand side of the slide is an almond orchard in January of 2017; the trees are dormant and it was pouring down rain. In January, while it was raining, the farmer applies 6 inches of water to dormant trees in the rain because that’s when the water was available, and researchers watched where that water went. This is important information for predicting which part of the orchard is most suitable for infiltrating water, and if you have to fallow land, deciding which land to fallow and which land to use for infiltration. It’s also important to know how much water can be applied without hurting the trees because how fast the water infiltrates is important. “All of that more detailed understanding of the subsurface relates to how this land can be used for that kind of process, and that’s what we’re trying to help with,” Dr. Nico said. Researchers have also been studying subsidence which, in simple terms, refers to the sinking of land due to withdrawal of water from the underlying aquifer. Subsidence has been a problem historically and continues to occur. 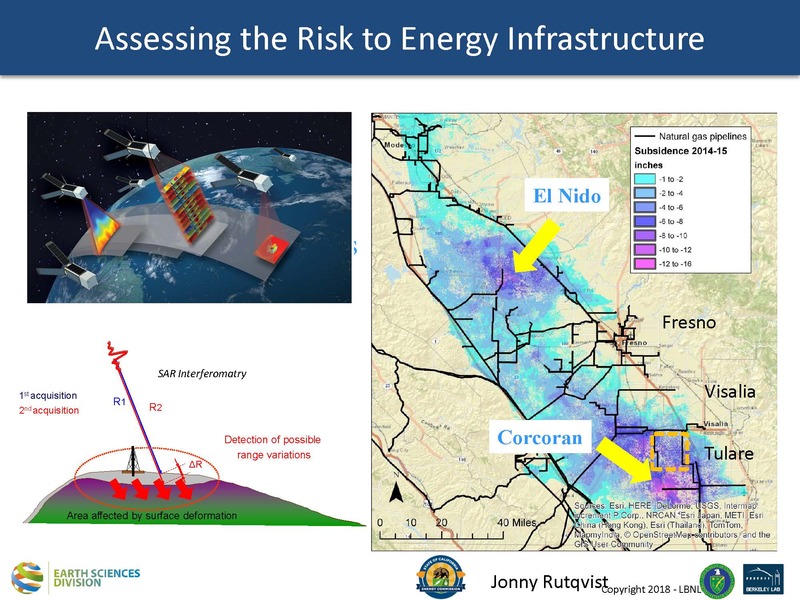 Subsidence is now monitored from space by satellites bouncing laser beams off of the ground. Dr. Nico presented a map showing subsidence in the Central Valley from 2014 to 2015, noting that the areas in blue around Tulare and Visalia are where 12 to 16 inches of subsidence occurred due to groundwater pumping in the area; the black lines on the map are natural gas pipelines which can be damaged by subsidence. Researchers are using subsurface modeling and prediction capabilities to predict risk and stress on natural gas pipelines from subsidence in an effort to try to understand how that water result is coupling with the energy infrastructure. With satellites flying over California and collecting data every week or so, the subsidence can be monitored in very fine time resolution. On a more positive side, the ground goes down but it also comes back up somewhat in wet years. The graph on the slide shows the subsidence at a single point in the Tulare Irrigation District over two and a half years; the blue bars are the winter season; the white spaces are the summer season. 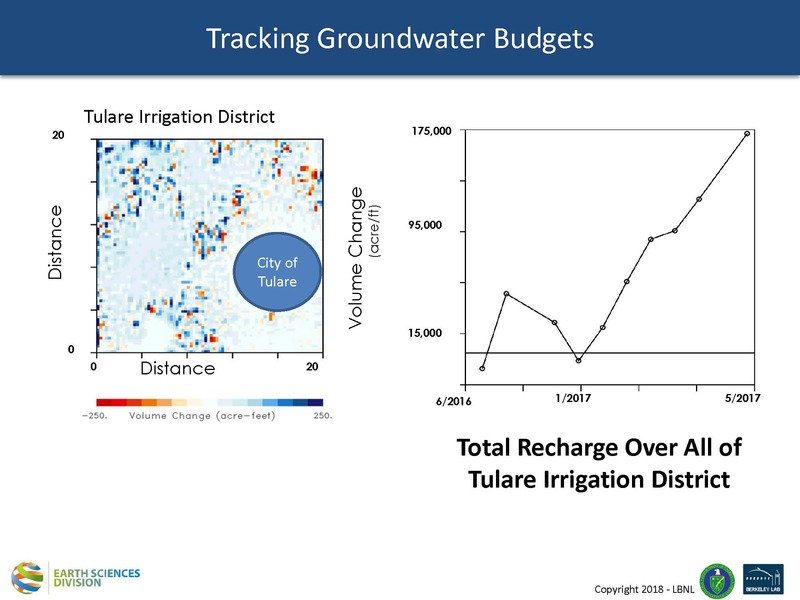 The ground movement can be used to create a map of the entire Tulare Irrigation District, shown in the left corner of the slide. Each pixel on the map is colored red or blue, representing whether the ground went up and down. “You can see the amount of recharge that there was, and we can integrate that over the entire Tulare Irrigation District and we can say that that wet winter recharged 175,000 acre-feet of water,” he said. The researchers contacted the head of the Tulare Irrigation District, and told them what they had estimated for recharge, an as it turns out, the District had estimated recharge at 173,000 acre-feet. “We’re in the right area for this and we can do this by satellite in real time, up and down all the time to help keep track of where the water is coming and going from,” he said. 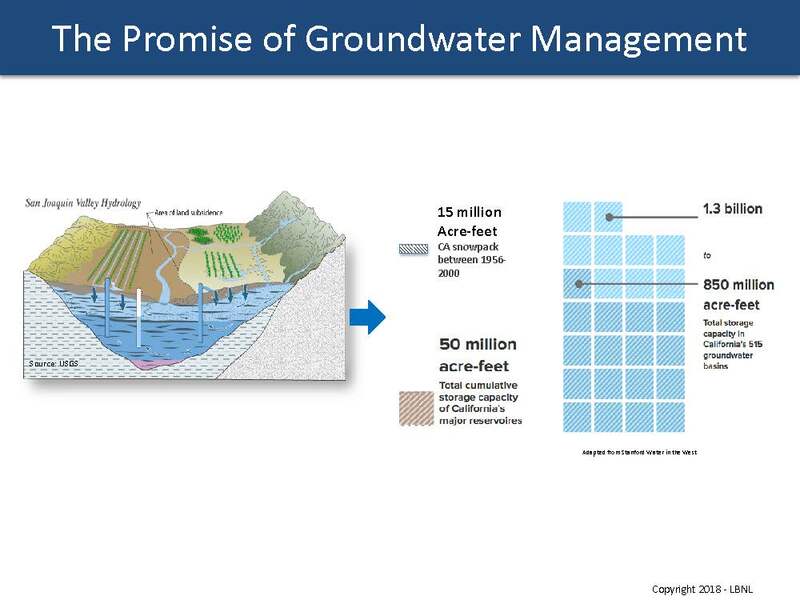 Lastly, there is the issue of preserving the water quality while managing groundwater, which is a big challenge. The map shows wells in California that have arsenic above the 10 ppm level. Dr. Nico noted that this is not contamination because somebody spilled something on the ground; the arsenic is naturally-occurring and coming out of the sediments. 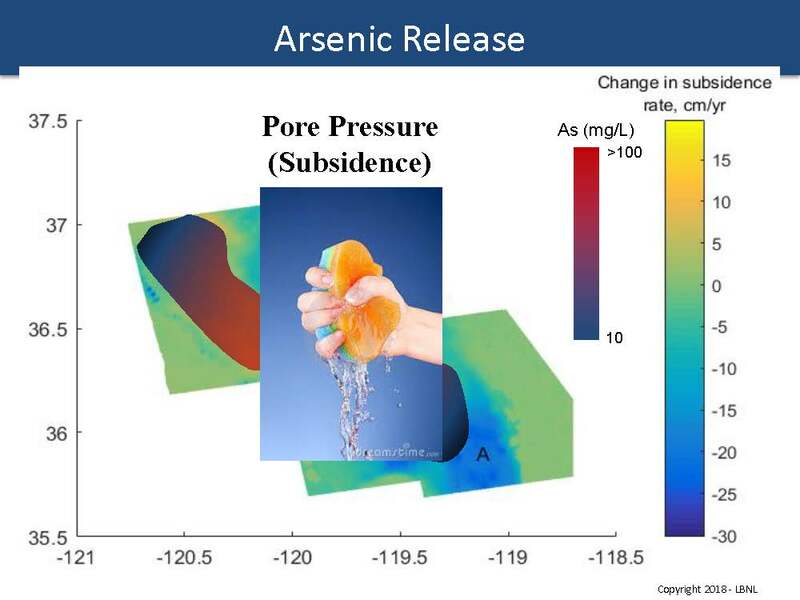 He presented a slide showing where the arsenic is coming out into the water, noting that the arsenic is coming out into the water in the same places where the groundwater is subsiding more; this is because as the ground collapses, the layers that have the high arsenic water in them are being squeezed, causing the arsenic to come out into the rest of the water supply. Dr. Chinmayee Subban is a researcher in the Energy Technology Area at the Lawrence Berkeley National Laboratory who has been working on developing a technology to treat brackish water. She noted that it is because of the State Water Project (and the Central Valley Project) that has made California the top supplier of nation’s fruits, vegetables, and nuts; one-third of all vegetables and two-thirds of all fruits and nuts consumed in the US are produced in California. California’s land area is about 100 million acres, 43 million acres of which is used for ag. 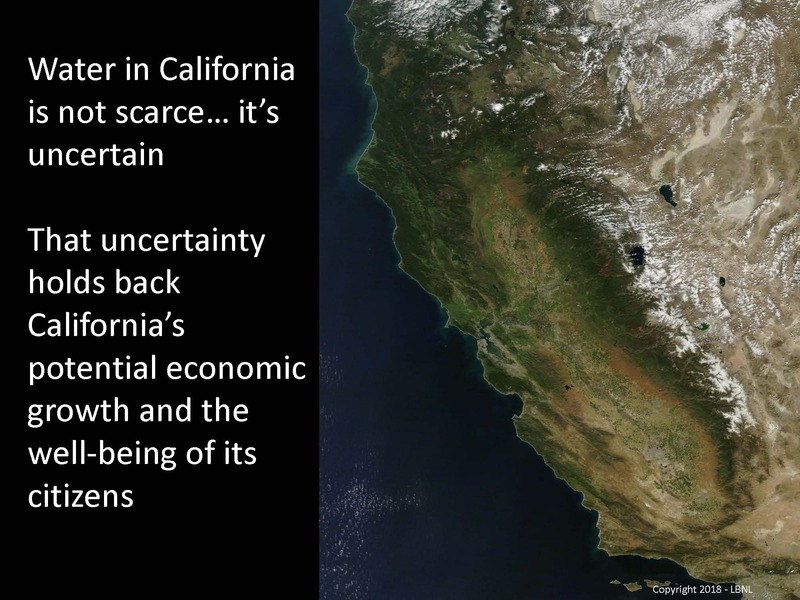 Of that, just 9 millions of acres is used for irrigated agriculture, but it is that 9 million acres that is responsible for 62% of all economic output from agriculture in California and so the state has really deemed it prime, unique, and statewide important land, she said. 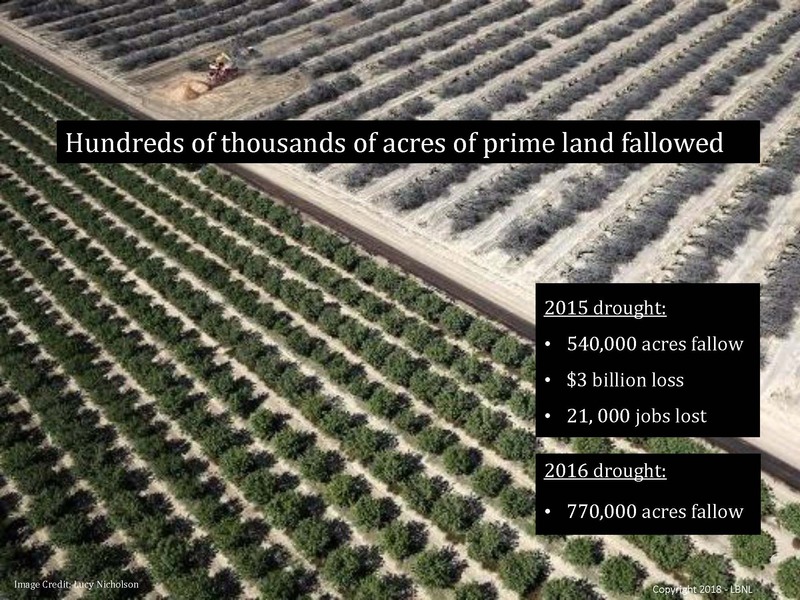 However, in recent years, some of the land had to be fallowed with the 2015 drought causing about 540,000 acres to go fallow and resulting in $3 billion in losses, as well as about 21,000 lost jobs. In 2016, 770,000 acres had to be fallowed. One of the options for finding water supplies for agriculture is to look at brackish groundwater, which is currently an untapped resource, she said, explaining that freshwater is defined as anything that has half a gram of salt of less per liter or water; seawater is about 35 grams of salt per liter of water, and brackish water has a lower salinity window, about half to ten grams of salt per liter. 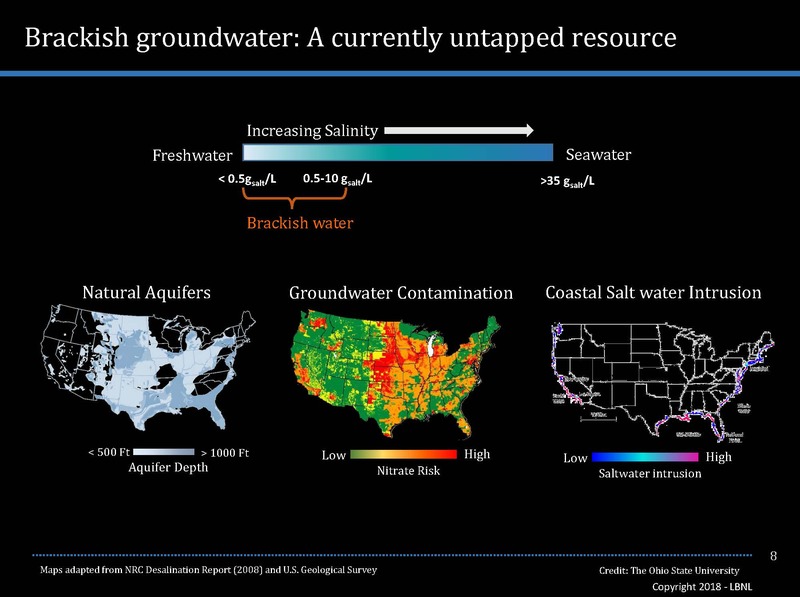 There are a lot of naturally occurring brackish aquifers that have been found, but there are also new sources of brackish water generated as a result of human activity. 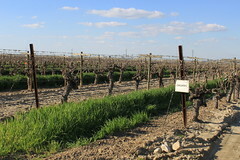 One example is groundwater contamination from fertilizer use in agriculture-heavy areas such as the Central Valley; another example is seawater intrusion into groundwater in coastal aquifers. 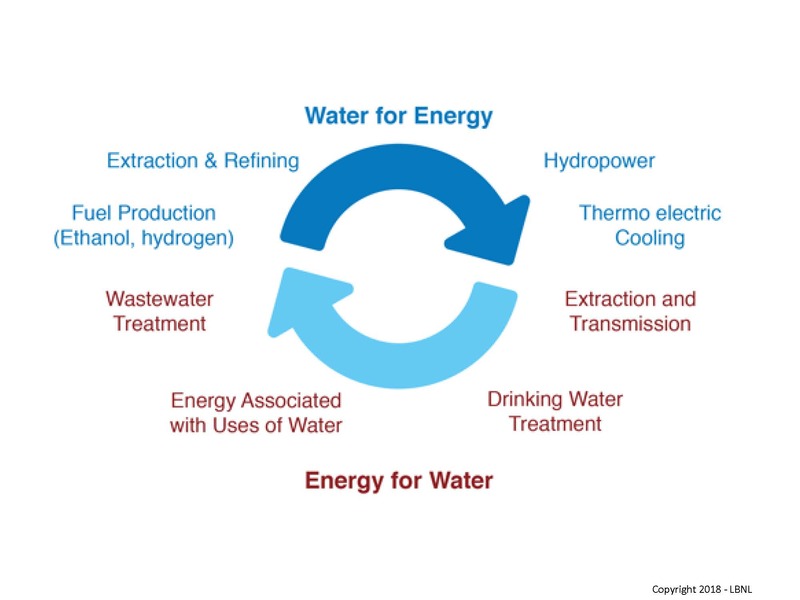 At a high level, the brackish desalination process involves passing brackish water through a technological process to separate the water and salts, which will yield a freshwater stream suitable for irrigation and a second stream which is a waste brine with the salt concentrated in it. A desirable technology would be very energy efficient, have a high freshwater recovery, be inexpensive, easy to operate and maintain, and modular so it can be used at different site scales. 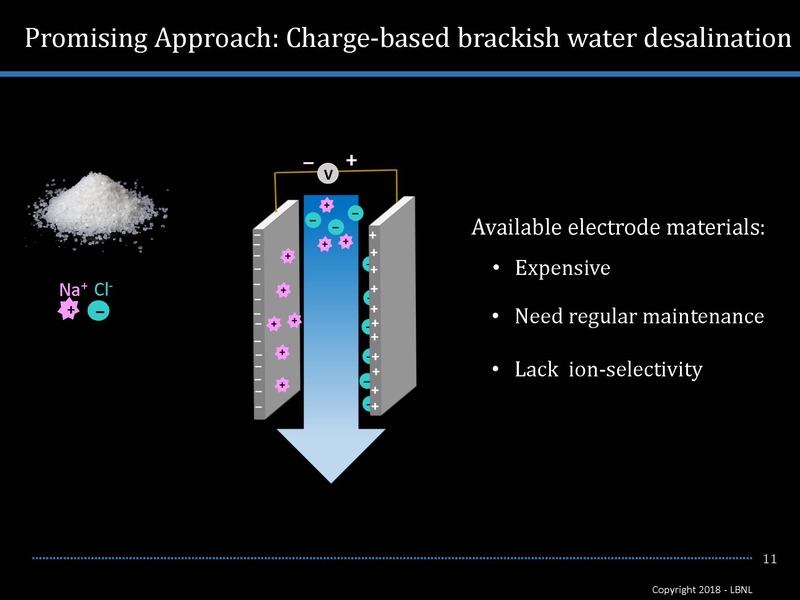 So for low salinity brackish water, the ideal approach is to look at charged based salt separation. 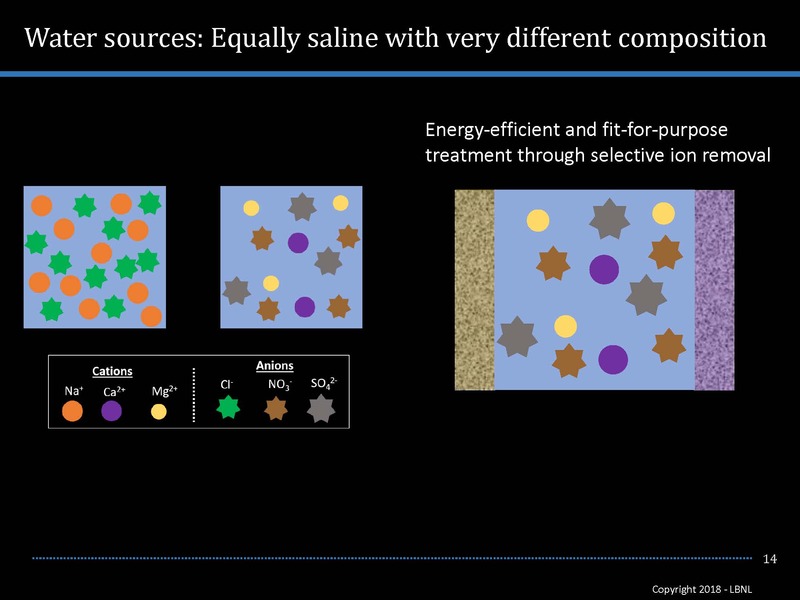 Dr. Subban explained that when salt is dissolved in water, it splits into sodium ions that are positively charged and chloride ions that are negatively charged. If a voltage is applied, the positively charged sodium ions will be attracted to and stick to the negatively charged plate, and the negatively charged ions will be attracted to and want to stick to the positively charged plate, and the result is salt-free water. This technology is attractive for low salinity water sources, but the problem is that the materials are too expensive and not robust, and sometimes can’t select for specific ions. So to address this, researchers at the Berkeley Lab have developed low cost electrodes by utilizing industrial-scaled inexpensive polymer materials and composites that work very well. These materials have been tested in a prototype unit to make sure they can reproducibly remove salt. Currently, researchers are evaluating the scientific and engineering challenges in terms of limitations and opportunities for this technology, specifically looking at how the technology performs when the water quality changes, how it can be operated to be the be most energy efficient, and how it can be scaled up and down. By designing the right materials, the harmful substances can be removed, and the substances that are not harmful can be left behind, and this has clear applications in the state of California. These are the opportunities that researchers are exploring, but in order to do it in an effective way, they must communicate with people that are going to use it. 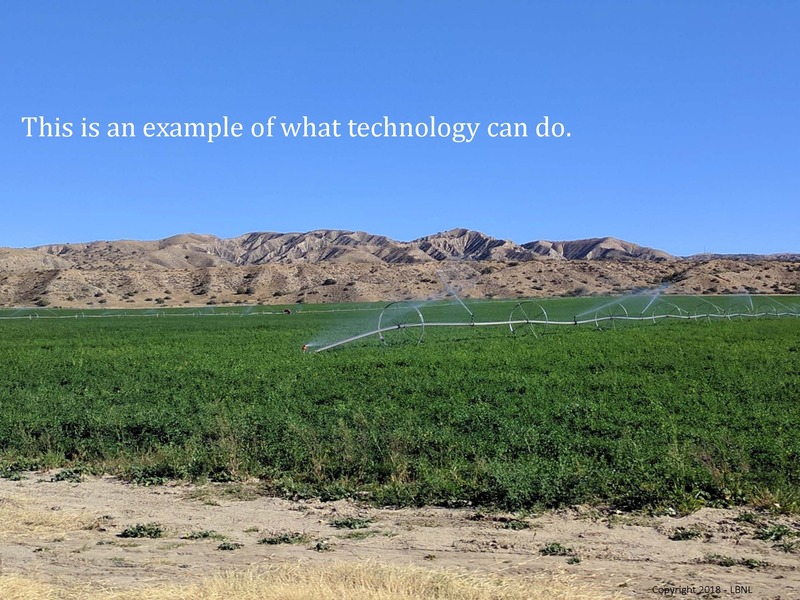 So lab researchers have been engaged regularly with growers in the Central Valley, Coastal California, and Southern California to understand their constraints, the challenges they face, and how this technology would be applied. They also partner regularly with the UC Extension Agents in collaborating on projects, because they are in the field and are experts on agriculture, and obtaining the real-world view is important to do, she said. Researchers also consider the energy impacts for the state. 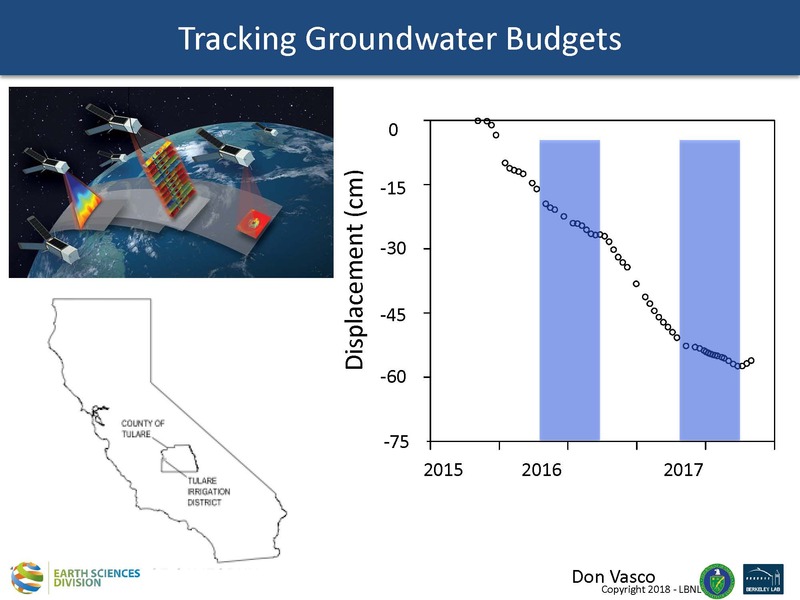 California has a lot of excess solar agency, so is there a way desalination technologies which require energy can offset some of the excess solar, and can demand response be accommodated? These are some ideas that researchers at the lab are working on. Taking a technology or any new idea and implementing it requires a highly interdisciplinary team of people working together, so at Berkeley Lab, there area a variety of different project experts from policy to technology to economics working on projects together, she said. 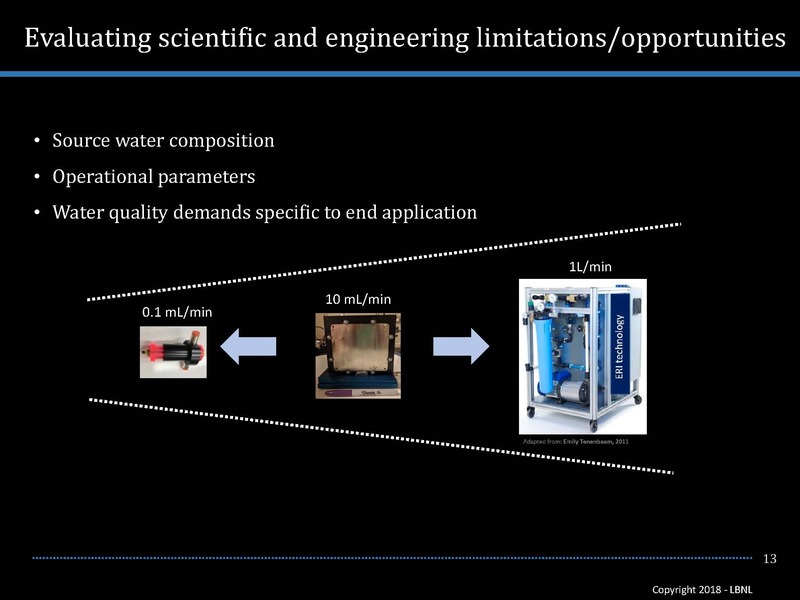 Dr. Dan Miller is a staff scientist in the Chemical Sciences Division at Lawrence Berkeley National Laboratory and the topic of his presentation was desalination by reverse osmosis. The Department of Interior established the Office of Saline Water in 1955, and for 17 years, a broad portfolio of different technologies were funded to develop desalination technologies, including one of the very first saline conversion plant which was located in San Diego. At the time, two researchers at UCLA, Loeb and Sourirajan, were working on cellulose acetate membranes that were capable of separating salt from water. They found that these cellulose acetate membranes would allow water to pass through while rejecting salt and not allowing it to pass through. They struggled for many years with funding from the state of California with membranes that were too thick and didn’t allow enough freshwater to go through. In 1963, just one year after President Kennedy’s famous quote, Loeb and Sourirajan had a breakthrough: They discovered a way to cast these cellulose acetate membranes into asymmetric structure. Dr. Miller explained that the cellulose acetate membrane they developed had a very large pore structure at the bottom, much like a sponge, but as you move up through the membrane, the pores get smaller and smaller; at the very top, there is a very thin, essentially non-porous skin layer of cellulose acetate at the top. This thin layer at the top allowed a lot of water molecules to go through, but was still sufficient to block the passage of salt ions. Loeb and Sourirajan continued to work on these membranes throughout the 1960s and the technique perfected in the late 1960s by researchers in San Diego. This forms the basis of all of the commercial desalination membranes that are in use today. Modern desalination membranes reject 99.7% of the salt that comes into contact with them, which means for every 1,000 molecules of salt that are fed to the membrane, only three molecules will go through. If a semipermeable membrane is placed between two chambers, one with freshwater on the left side and one containing salt solution on the right side, the membrane will allow water to go through but will block the salt, and the water will tend to move from the freshwater side into the salt solution to try to dilute the salt. That movement will create a pressure as the fluid on the right hand side as the salt solution rises, and eventually will reach a point where the pressure is great enough to prevent any further water from flowing through the membrane. In reverse osmosis, a pressure is exerted in the salt solution that is greater than the osmotic pressure which squeezes the water backwards through the membrane, thus the name, reverse osmosis. In practice, a typical reverse osmosis process takes the seawater coming in, puts it through a high-pressure pump that increases the pressure of the seawater; this is where most of the energy is consumed in reverse osmosis. The high-pressure water then goes into a membrane module, the water comes into contact with the membrane, the membrane lets the water can go through and the salt is rejected into a brine. Current reverse osmosis membranes are manufactured in flat sheets by the mile; the long sheets of membranes are then cut up and folded into envelopes and they are wound into spiral wound modules. This allows a tremendous membrane area to be packaged into a relatively small module volume. A typical membrane module contains approximately 500 square meters of membrane per cubic meter of module – roughly a football field of membrane. Membrane modules are manufactured in a huge variety of different sizes, from very large, industrial modules that are used in municipal treatment down to very small modules that can be used under your kitchen sink. Although reverse osmosis is very often described as a power-hungry process, Dr. Miller said that reverse osmosis is actually remarkably efficient. The minimum energy required to separate salt from water, assuming no loss of energy of any kind, is just over 1 KW per cubic meter of freshwater that’s produced. Because of the compact nature of the modules and the relative efficiency of reverse osmosis processes, desalination world-wide is now a very large scale process, with 90 million cubic meters per day of desalinated water being produced – about 6 times the amount of oil per day that is produced. This desalination happens in over 18,000 desalination plants in 150 countries and it supplies drinking water for 300 million people around the world. The United States is the second largest desalinator in the world, just behind Saudi Arabia. The Carlsbad Seawater Desalination Plant was completed in December of 2015. The plant produces around 190,000 cubic meters of freshwater a day with 14,000 reverse osmosis modules that have about 576,000 square meters of total membrane area – or about 100 football fields worth of membrane. The Carlsbad plant produces enough water for about 7% of San Diego’s consumption – about 300,000 people. However, Dr. Miller said that despite the promise of desalination, challenges remain. One of the key problems is that many reverse osmosis membranes do not adequately reject many toxic compounds, such as organic micropollutants such as boron and arsenic. The typical arsenic rejection of a state of the art reverse osmosis desalination membrane is about 70 to 80%, which is far below the 99.7% salt rejection that those exact same membranes exhibit. In order to remove the arsenic, they would have to have some kind of auxiliary purification technology to remove the arsenic separately, or run the water through the reverse osmosis process twice, which would then use twice the amount of energy to produce the same amount of water. Arsenic is a huge problem in California, especially if reverse osmosis is used to purify water for agriculture, so developing reverse osmosis membranes that more effectively reject toxic compounds like arsenic would significantly improve water quality and reduce energy consumption, Dr. Miller said. Fouling, or clogging of the surface of the membranes is another challenge, especially in seawater desalination. For example, the Carlsbad Desalination Plant takes in the seawater from a lagoon just outside of the city, which contains substances such as organic matter, particulates, microorganisms and minerals; these substances sucked up into the plant and clog the surface of the membrane. Fouling reduces the membrane productivity because the membrane is clogged and not as much pure water can go through it, so more pressure is needed for the freshwater to go through the membrane, increasing the energy requirement substantially. One of the solutions Dr. Miller and other researchers are looking at is engineering the surface of the membrane so that it is less prone to fouling. Visit the Lawrence Berkeley Lab online by clicking here.